Armor-plated rats the size of collies. Military planes that look and move like dragonflies. Public transit by dirigible and pneumatic tube. Mechanized horses that pull carriages. New York City floating on a series of elevated platforms. Such are the delightful oddities found in Andrea Cremer’s steampunk novel for teens The Inventor’s Secret. Steampunk is a subgenre of speculative fiction often set in a Victorian or quasi-Victorian background. It may feature steam-driven machinery and objects powered by clockworks, gears and cogs, similar to H.G. Wells’ time machine and Jules Verne’s Nautilus. The stories frequently portray an alternative history—something that could have happened but didn’t—and are often set in Europe. Cremer creates in her novel an America in which the British, not the Americans, won the Revolutionary War because they failed to enlist the aid of France. Britannia gave Canada to the Native Americans and returned Florida to Spain so they would not side with the upstart colonists. Britannia then burned Boston, hung the Declaration of Independence signers and sentenced their descendants to years of indentured servitude. The population lives in a rigidly stratified culture and those who fail to adhere receive harsh punishment. Yet behind the scenes, revolutionaries continue their guerilla warfare. In Ms. Cremer’s book, we meet a society of children living in the catacombs beneath a mountaintop waterfall. Once they turn 18, they will join their parents who still fight Britannia from the shadows. Sixteen-year-old Charlotte is one of the catacomb dwellers scraping out an existence at the edge of Britain’s imperial empire. They spend their time scrounging through metallic scrap heaps for usable parts, looking for food and trying to avoid the Labor Gatherers who collect “stray” people for forced labor. It’s on such a mission that Charlotte rescues a boy running from the mechanized Gatherers. He cannot remember anything about his past, not even his name. But he is very strong. And he is magnetized. Charlotte’s brother Ash leads the catacomb kids along with his second-in-command, Jack. At first they don’t favor letting the boy—nicknamed Grave —stay. When Meg, the group’s teacher and caregiver sides with Charlotte, Grave is accepted. Meg is certain he is very important in some as-yet-undetermined way. Jack and Ash must leave the catacombs for a secret meeting with the revolutionaries and some of the Brits who support the colonists’ ongoing bid for freedom. Jack, as it turns out, is a wealthy and esteemed member of Britannia’s military ruling class. Meg has secrets of her own and insists on taking Charlotte and Grave along to find out more about him. The group devises an elaborate plan wherein Charlotte, masquerading as a debutante and escorted by Jack, journeys to New York City along with their “servants,” Ash, Grave, and Meg. Dressed in post-Victorian finery, Charlotte hides in plain sight while Jack and Ash meet with rebel leaders and politicos. Meg, Charlotte, and Grave visit a seer who warns of terrible things to come, and hints about Grave’s dark secret. 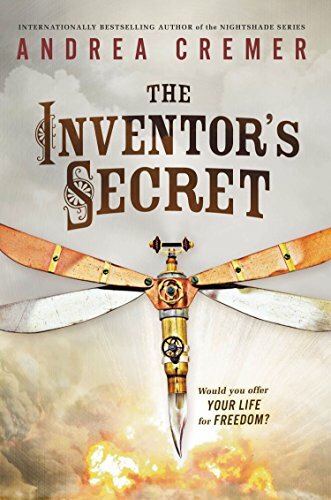 Original and highly entertaining The Inventor’s Secret juggernauts its way through the cruel and corrupt society that might have been if the American colonists had not won their fight for freedom. Cremer delivers it all: intrigue, romance, dangerous adventures, imaginative machines, and perilous secrets. What more could anyone ask for? This is a delightful read.